Here are 7 of my favorite Bible verses to read when you feel sad about things. What ones would you suggest? Have you ever been like me and broken down and cried out to God in times of great trouble? Just think about what God says; He is nearer to you then than at other times. Have you ever felt “crushed in spirit?” I certainly have and it makes me fall down on my face and cry out to God but what comfort there is in His Word that the Lord hears our cries and will deliver us out of all of our troubles. I notice that these verses don’t say God will keep us out of all our troubles or have us pass around them or go over them but will deliver us out of them and not only that, He will deliver us out of them all! It is frightening not knowing the future and it can be discouraging when things start to pile up on us. We can become so burdened down with the troubles of the world that we can grow into a deep depression and times of sadness can overwhelm us but Jesus tells us “Come to me, all who labor and are heavy laden, and I will give you rest” (Matt 11:28). When we are feeling sad we are often not in the Word but when we are in the Word we are often not feeling as sad. Use God’s Word to lift you up and out from the waves of deep sadness or depression because God’s Word has real power to accomplish what even the best human counselors cannot. There is no way that you can be feeling sad when you are giving thanks to God. When we are rejoicing for all that God has done, we can’t be feeling sad because these two are polar opposites of one another. Many people that I counsel with that have severe depression, times of sadness, or have a lack of the assurance of their salvation are spending little or no time in the Bible and that’s too bad because it can bring us out of the darkness into the light because “faith comes from hearing, and hearing through the word of Christ” (Rom 10:17). No one can have the peace of God until they are first at peace with God and those who are born again should have this peace (Rom 5:1) because they’re not under condemnation anymore (Rom 8:1). Whoever has their mind “stayed” on God, He promises to keep them “in perfect peace.” Why you might ask? It’s because they trust in Him. Trust or faith is the other end of the spectrum of doubt and fear. It’s so easy to have times of sadness when we take our minds off of the great and precious promises of God and “he has given us great and precious promises. These are the promises that enable you to share his divine nature and escape the world’s corruption caused by human desires” (2 Pet 1:4) and every one of those promises are found as sure in God (2 Cor 1:20). Imagine you are one of the children of Israel and you’re about to cross the River Jordan into the Promised Land and God speaks to you and says that the Lord is going before You, He will be with you, and He will never leave you or forsake you so you have no reason to fear or be dismayed. What applies to Israel surely applies to the children of God and more. Yes, this verse’s application is for Israel but would it not be applicable to us today? How true this is! God’s peace is not like the definition of peace that the world understands. This peace surpasses all human understanding because its source is not of human origin and this peace is a tangible peace; that is you can touch it, feel it, and almost taste it. It is a powerful peace that acts to guard our hearts and our minds in Jesus Christ. This reminds me of Deuteronomy 31:8 where God tells Joshua that He will be with you, will not leave you and will not forsake you so we don’t have to be fearful or dismayed because God’s not only going with us, He’s going before us; that means that what’s ahead of us, God has already seen! Jesus Himself said “Do not let your hearts be troubled. You believe in God; believe also in me” (John 14:1). That is an imperative command. If we believe in Jesus Who is very God, then our hearts shouldn’t be troubled. If you are in a state of sadness and remain there for a long period of time, I suggest you see your doctor. It could be signs of clinical depression. Waves of sadness hit all of us from time to time and it’s not unusual to go through what I call the “dark nights of the soul” but there is a problem if we remain there on a permanent basis. Clinical depression is treatable and it could be a simple brain chemical imbalance and don’t ever think it’s a lack of faith to go and see a doctor. 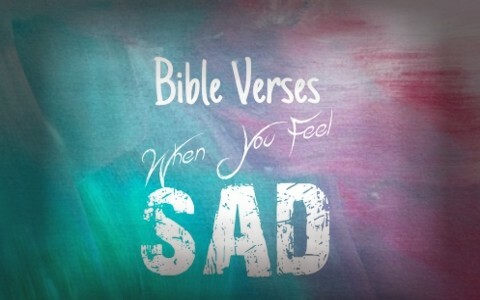 May I also suggest that when you’re really sad, you get into the Psalms? Read Psalm 23, 37 or 103 for example and see just how faithful God is to those who have faith in Him. God doesn’t want you to remain in a state of sadness but to have joy for the “joy of the Lord is” your “strength” (Psalm 28:7). Don’t we have every reason to be joyful? We have God’s wrath removed from us because it was placed on Christ. We have been born again to new hope and are headed for a new home (Rev 22) and we have a glorious future that today we can’t even imagine (Rom 8:18). When we see things from God’s perspective, and that comes from abiding in God’s Word, we’ll feel less like being sad. A great way to get rid of your sadness is to make out a list of things you’ve been blessed with. Write out a list of every blessing you can think of and start praising and thanking God for all the many blessings He’s already given you and those He’s promised for eternity (John 3:16). It’s really hard to be sad when you are being thankful. Thank you very much for this article. My strength is renewed and feel the joy again of my salvation. God bless. Thank you for your kind words. Glory to God for His Word comforts us when we are down. Thank you for your kind words Naomi. Glory to God for His Word comforts us when we are down. Thank you, Mr. Wellman, dearest brother in Christ. Very poignant and flowing into peace. You are very welcome Mrs. Knowlton. Thank you for your kind words. Glory to God for His Word comforts us in times of sadness. Thank you for your article reminding of God’s Word and Truth …Absolutely God is Totally Trustworthy and Radically Reliable and Completely Countable! Praise Jesus forever and ever hallelujah! His Love NEVER FAILS ! It becomes most trying when family and all other horizontal human relationships get on the negative…it produces depression and sadness! Vertical relationship= intimate personal love relationship with Jesus is the Ultimate Best…and of Utmost importance as it is of Eternal Value ! Your article uplifted me and reminded me where to focus as I go through one of those dark nights of the soul. It is so true that immersing oneself in the Word helps avert the way the world can make us sad. Need to get back to being diligent. Loved your verse selection. Thank you. Thank you so much for this! I was feeling down and out the last few days and after reading this my faith is renewed. Laying all my burdens upon the lord. Feeling hopeful. Please pray for me. I have a grandson who has autism. I am raising him because his mother doesn’t want him and his father who is my son is not in a position to have him due to choices that are not good. I have an extremely hard time with this boy as I think his parents should get it together and raise this boy. I have no patience and don’t really want to raise him. I already have another grandchild that I am raising from birth. She is five now and my grandson is 6. My youngest is 16. I don’t know what is wrong with me, I pray that God gives me love for this child who has autism and I am continually asking for forgiveness because there are days I feel like I can’t handle him. I sometimes wish I could find him a home where he is wanted and loved. It truly feels like a circle that never ends. This is my 5th time in taking this boy in. I am a born again Christian but in this I know I don’t act like one and it bothers me tremendously. Hello Anna. You are in a very difficult place my friend, but you being his grandparent is a lifeline for this boy. There is nothing wrong with you, because anyone in your place would find it impossible to do what you are doing and you are serving and loving those who no one else would and that means what you do for the least of these in this world, you are doing unto Christ. I would call your pastor to see what he says and perhaps ask your church to pray for you as we need one another (Heb 10:24-25). I never thought of myself of a lifeline for him. Or serving the least. I will talk to my pastor. Last night I felt very sad and I found your website. Thank you. My prayer is for you Anna. What you are doing is just what Jesus would do when no one else would. THat makes you very special in my eyes, but more importantly, God’s eyes. Thank you for a beautiful, enriching and ever so inspiring write! Thank you very much servant of the most high God. I am now empowered with the word of God which according to Hebrews I sharper than a double edged sword that it can divide souls. I now am armed to can face Goliath who always is against us as children of God. I know he is only defeated by the name of the Lord of hosts. May the Lord bless your work for his kingdom. This article popped out at me, I believe God ordained it that way. Thankyou for spreading God’s powerful word, it’s so very necessary.